Learning English in Manchester is synonymous to fun and exciting experiences in this place. Manchester is a metropolitan spot located at the Greater Manchester in the country of England. This town is part of UK’s largest and busiest cosmopolitan but it still has a quaint beauty amidst the modern setting of its buildings and establishments. When you choose to take up an English course in Manchester, you will also learn more about its culture. The people of Manchester are known as artistic people who have natural talent for music, sports, and arts. Learning English in Manchester will also expose you to the unique way of life at the North England. 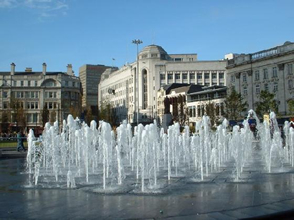 Manchester is a place where you can enjoy both natural and man made tourist spots. Since English is widely spoken here, you can practice your English lessons by a simple walk on the streets and a little chit chat with the friendly people. When you study an English course in Manchester, you will be taught by the best language teachers that came from England’s most famous schools. Not only that, an English course in Manchester will also give you a reason to stay and enjoy the country’s one of a kind ambiance. Manchester is a city filled with lots of exciting tourist destinations. While you are taking your English course in Manchester, you can also visit some of these famous places. One of these is the Ashworth Valley. You can find this place in the Hooley Bridge along the Bury-Rochdale Road. Ashworth Valley is famous for its 2 mile trek to Norden that lets you see the Cheesden Brook and experience walking in its majestic tree-lined valley. Another place that you can visit if you choose to take up an English course in Manchester is the Bogart Hole Clough in Blackley, Manchester. Here, you can find a wooded ravine that sprawls in the north eastern suburbs of Manchester. You can go to this place by following the Rochdale Road. You can also get the chance to hire a boat and ride through the lake. Bruntwood Park is another famous spot that you can visit in Manchester. Take a break on your English course in Manchester and see the lovely gardens and the enticing brook in this area. This place is also popular for their collection of evergreen trees that provides the place with a fresh and natural ambiance. You can also use their amenities like playground for your kids, a pet corner, and a BMX cycle track. You can also go to the Jumbles Country Park while taking up an English course in Manchester. This place features ninety miles of farmland and green valleys. You can bring your friends and your family here for a picnic under the shade of the trees. This park also has some restaurants and snack bars where you could go if you feel hungry. 100% guaranteed, that you will pay the lowest price for English courses in Manchester. We offer you the lowest possible course rates - you never pay more than if you booked directly with the school itself or anywhere else. Besides, our service is free. We do not charge any booking fees. It's very unlikely that something will go wrong with your booking once confirmed by the English language schools in Manchester. In fact we're so confident, that if you don't have your course place at the selected school, we'll credit your account with your full deposit AND find another possible alternative for you.